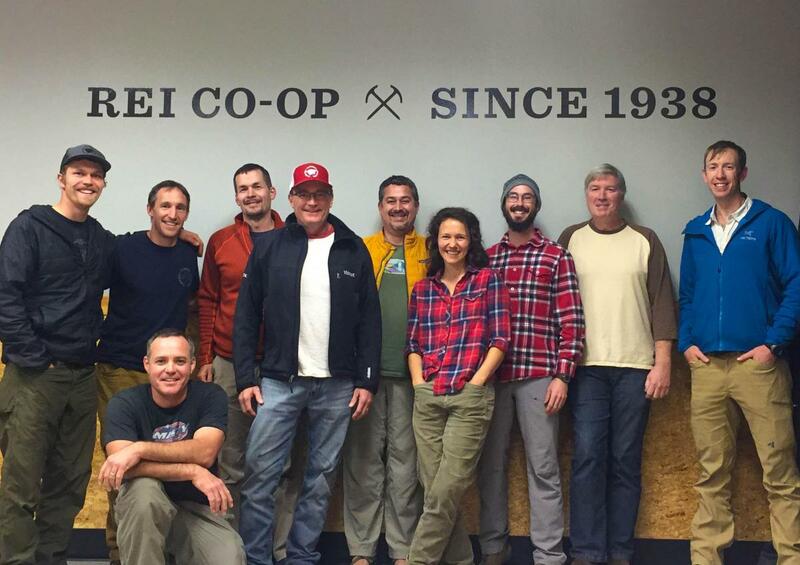 The members of the Carolina Climbers Coalition board met on December 3, 2017 at the REI in Asheville, North Carolina. We utilized their meeting room to talk about our status and future. We appreciate the continued support of REI. With the purchase of Buckeye Knob finalized, we need to improve the accessibility of the area. In the short term, we want to focus on building a sustainable trail through one part of the approach in particular. The trails that Joey Henson established around the Barn Boulders are more than sufficient down low, and the old Native American trail on top of the ridge line is absolutely incredible. Between these, we are going to have Tony McGee, one of our 2017 Kayah Gaydish Stewardship Award recipients, flag out a low-angle line. We will rely on our members to volunteer their time at trail days to build the path. Stay tuned! In terms of parking at Buckeye, Mike Trew has been in charge of exploring a new lot off of Laurel Branch Road. Unfortunately, the open space outlined in our recreational easement is a somewhat challenging wetland. Construction of this parking lot could run $20,000 or more, but we are in the early stages of assessing its cost. In the meantime, climbers are welcome to park in the small lot up the dirt road accessing the Barn. If this area is full, you may also park along Laurel Branch Road if your tires are completely off of the pavement. We plan to release more accurate directions and a topo map of the boulders soon. As part of our fundraising efforts for Buckeye Knob, we have been exploring opportunities to improve our event presence. This fall, we ordered a new, branded pop-up tent and a couple of table covers. We also ordered several Square card readers. Now, each region should have a permanent tool for accepting payment at events. Although we all agree that strong event presence is important for growing membership, for the time being, we decided to hold off on purchasing any more branded materials and signage. Instead, we’re exploring a logo update as we’ve had the original for many years. The current logo is still popular amongst many of our members, but we feel that owning a sport climbing crag and two bouldering areas warrants a brand identity update. After we have the new logo design we will be able to further update and increase event kits. Eagle Rock, our most recent access project, will act as a model for coordination with Chimney Rock State Park and Conserving Carolina to work towards increased access in Hickory Nut Gorge. The CCC has spearheaded the funding of a climber access trail, which is a spur off of the newly constructed Weed Patch Mountain Trail. The trail has been funded by a grant from that the CCC obtained from REI, a Cornerstone Conservation Grant through the American Alpine Club, the CCC, and Conserving Carolina. The climber spur trail, including a long series of beautiful stone steps, began construction this month. We’re currently working with to find a reasonable parking option for Eagle Rock. Right now, the only way to approach Eagle Rock is from the other side of the 10-mile Weed Patch trail, starting in Buffalo Creek Park. Conserving Carolina did not intend for their Weed Patch Mountain Trail to be out-and- back, so everyone’s working together. The nearby neighborhood presents a variety of options. We’ll keep you updated. Brian Payst debriefed with the board about specifics of the new Sauratown lease with Camp Hanes. Basically, we utilized money from an REI grant to fund phase one of a new, sustainable trail to the cliff line. Tony McGee started construction of the new trail this month. We plan to contact Camp Hanes alumni to raise about $20,000 more to complete the trail. Our leadership on this improvement provided us with an extended lease. Now, we can climb at Sauratown from December 1 - March 31 until at least 2037! In response to concerns of adjacent land owners, we decided to outright ban dogs at Hidden Valley and create new signage emphasizing the need for quiet recreation. Our neighbors who own the cliff line left of the Meat Wall reached out asking us to keep quiet during hunting season. If they continue to notice dogs barking, music playing, or climbers yelling, we could lose access to some of the area’s most popular walls. We have approached them about purchasing the land near the cliff line before, but they aren’t interested in selling. In April, we will have our first opportunity to utilize the group of individuals who pursued the title of National Forest designated Trail Crew Leaders. About 10 CCC members attended a training last winter to attain this certification. With their direction and permission from Pisgah National Forest rangers, we can now host our own trail days. During the Pisgah Conservancy’s annual Pisgah Pride Day, we plan to work on trails at the North Side of Looking Glass or the Nose Area. Mike Reardon requested that we add an anchor replacement database back to our website. The resource will act as a to-do list for trusted representatives in each region. The board’s area rep has the authority to screen potential anchor replacement representatives. Trusted individuals have access to our bolt supply through the American Safe Climbing Association. Although the database won’t have forum functionality, board members will be able to update the list and request hardware for updating routes in their territory. Will Goodson spent a long time creating a detailed report of the CCC income and expense channels. He expressed the need to streamline our accounting tools and record keeping to strive for improved clarity. When making entries on the books, he has to check several modes of communication to find notes about the event to which the money corresponds. Instead, we may benefit from a standard, Google survey that board members fill out after each event. Brian Payst will also be coordinating with Will to leverage the information in our Constituent Relationship Management system. Will recommended that we find a way to process recurring payments. These auto-debit systems are an easy way for members to stay current. We may find that they provide more consistent revenue stream.